Decimal fields have decimal precision of 28, and store numbers from –10^28–1 through 10^28–1 (or –10^38–1 through 10^38–1 in ADPs). In the above example, negative values appear before positive values, and 0 appears at the end of the list. This issue is documented in Microsoft's KB article 837148. Decimal types use more storage space than other numeric field types. The best solution is to avoid using Decimal field size altogether. 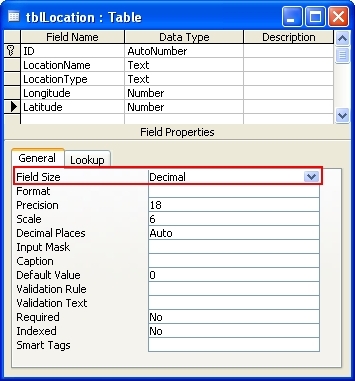 Instead, use the Double field size for numeric fields that require decimal values.